They were both found totally alone and too young to survive on their own. 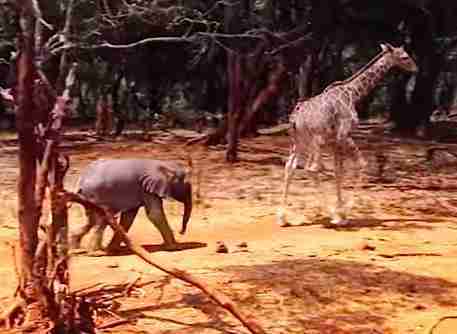 A tiny baby elephant was discovered in Kenya, wandering around disconsolately with no sign of his family. The people who found him knew he needed help immediately, so they contacted the experts. Rescuers from Save the Elephants teamed up with The David Sheldrick Wildlife Trust (DSWT) to bring the baby to safety at the trust's Nairobi orphanage. 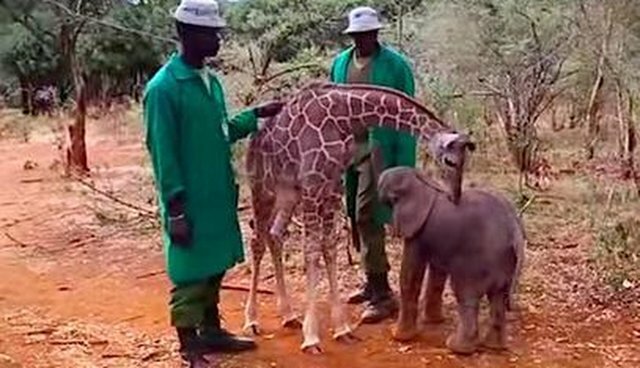 Rescuers named the baby elephant Loboito. Loboito means "the only one." But he wouldn't be the only one at DSWT, a haven for orphaned elephants and other animals in need. Its latest (and tallest) rescue animal came to the orphanage on September 19: a baby giraffe who was found lost and alone just like Loboito, also too young to survive by himself. Rescuers named him Kiko. 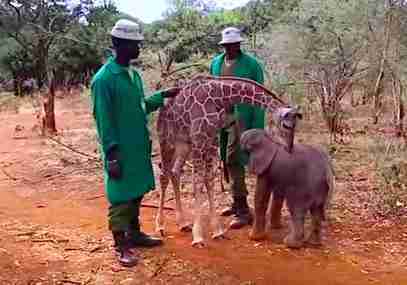 "When tiny infant elephants arrive in our care, they are often extremely fragile and it can be touch and go for several weeks," a representative from DSWT told The Dodo. "We are currently providing Loboito with the intensive and specialist care he needs, as well as a new family." This new family includes the sweet people and animals at the orphanage, particularly Kiko the giraffe. As Kiko helps show Loboito the ropes at his new home, staff members are keeping a close watch on Loboito, since the trauma of losing his herd can have dire consequences. "At such a young age, without his mother, he would not have survived long without her protection and nourishing milk – from now on, our keepers will provide full-time protection and support, not just from poachers and predators, but from the wind, rain, cold and hot sun during the heat of the day," the DSWT representative said. As Kiko is further along in acclimating himself to his new life at the orphanage, he's helping the newcomer Loboito along. "Having experienced unimaginable trauma from being orphaned, physically and emotionally, thanks to the swift work of Save The Elephants, we are hopeful Loboito will respond to the tender, loving care he receives from our team of keepers," the DSWT said. Kiko seems hopeful as well.